Futility continues in 1908 for the Cardinals as they finish 50 games behind the Cubs with a 49-105 record. In September, the Cardinals lose 27 games. For the season they are shutout 33 times and commit 93 errors. Righthander Bugs Raymond loses 25 games and 11 of them were shutouts. A few things about that season is that Raymond lost his first start of the year by allowing one hit as the team makes five errors and lost to the Cubs 2-0. More on Bugs Raymond: In September of 1907 the Cardinals purchased him from the monor leagues and became their best pitcher in 1908 with a 2.03 ERA with 145 strikeouts. Raymond had a spitball and was known for the crazy things he did on the field. He had a good season as he allowed fewer hits per game that the great Christy Mathewson. However, he was addict to alcohol and this shortened his career. 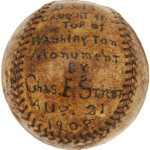 The Cardinals traded him to the Giants for Roger Brenahan before the start of the 1909 season;. Christy Mathewson of the Giants beats the Cardinals for the 24th consecutive time and on Sept 25th, owner Frank Robison dies in Cincinnati. In the off-season, the Cardinals fire manager John McCloskey and acquire a bat with Roger Bresnahan getting a four year contract to be player-manager. December 12, 1908: The St. Louis Cardinals traded Red Murray, Bugs Raymond and Admiral Schlei to the New York Giants for Roger Bresnahan. June 2, 1908 Charlie Rhodes selected by the Cincinnati Reds off waivers. August 3, 1908: The New York Giants purchased Shad Barry from the St. Louis Cardinals. May 29, 1908: The Chicago Cubs purchased Doc Marshall from the St. Louis Cardinals. September 1, 1908 Drafted Ralph McLaurin from Augusta (South Atlantic) in the 1908 rule 5 draft. With three seasons of poor baseball, the franchise is in jeopardy and interested parties are looking into purchasing the team and moving them. The league is talking about “contracting” them and eliminate their franchise. The franchise is in jeopardy!